Though only the Solar Exalted can wield the mighty power of Solar Circle Sorcery, they are not alone in wielding vast magic. The Deathlords and their Abyssal slaves can focus the vast power of the Malfeans into the black miracles of necromancy, evil magic equal to the mightiest sorcery of the Exalted. 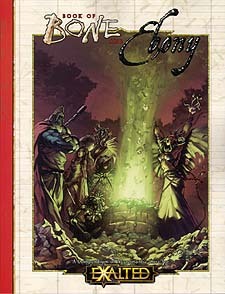 The Book of Bone and Ebony details the black art of necromancy and many other important facets of the Underworld. From the secrets of Stygia to the construction of necromantic war machines and new ghostly Arcanio and Underworld creatures, The Book of Bone and Ebony contains all the information necessary to unlock the powers of the Underworld for any game involving Abyssals or the heroic dead.